getting more from your partner programme. Are you a vendor or distributor with a partner programme? Do you wish it could deliver more? More engagement, more interaction, more uptake, more (dare we say it out loud) actual revenue? 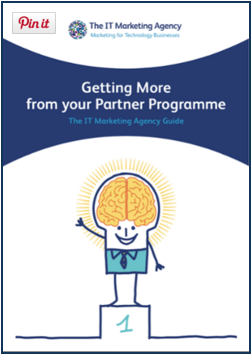 Then take a look at our 5 step guide to increasing the power of your partner programme. In it you’ll find out why you should show your partners the love, how best to engage, and what they’re actually looking for. From setting up partner advisory councils, to running EMEA wide, partner engagement programmes, our team has the experience to help you identify how you can set up (or improve) your partner programme to get the very best results.